Easter weekend is here, and that also means a visit from the Easter bunny and all the chocolate goodies! It can be difficult for parents to manage all the sugary treats. Here are some tips for Better Oral Health this Easter and preventing cavities this holiday. Drink water with your chocolate sweets – this will help wash away sugar, and bacteria from the teeth. Water is the healthiest beverage for our body and teeth. Choose PLAIN chocolate – Avoid hard candies, and sticky caramels which get stuck in our teeth. The longer the sugar stays around, the higher the chance of causing tooth decay. Save treats for mealtimes – Saliva is higher at mealtimes. This helps clean away sugars and neutralize the acids that cause tooth decay. Offer non-sugary treats – this is my favourite tip. Stickers, stamps, or a plastic egg are just as fun to find during an easter egg hunt. Another tip is to have a prize toy that is given in exchange for the plastic eggs that are found during the Easter egg hunt. Xylitol treats – Xylitol candies can be found online as a substitute for the regular sugary sweets. One site that offers the xylitol products is http://store.xylitolcanada.com/candy-mints/. Everything in moderation – The holidays can be a perfect time for our children to practice sharing with family, friends and neighbours. This will reduce the temptation at home, when the sweets are all gone. Don’t forget to brush and floss! – Oral home care is essential to preventing cavities. 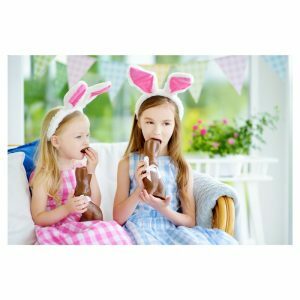 Spend a little longer brushing, or add an additional brush per day to help keep teeth clean during the Easter festivities. And don’t forget to visit your North Vancouver Dentist regularly for your dental check-ups and cleanings. Happy Easter from all of us at Third Street Dental. « Thank you for voting us Favourite Dental Clinic in the 2018 Readers Choice!